Clothing with a story has always fascinated me, even more so if there was a story to be told that’s ethically admirable. At the moment, I find myself increasingly drawn to fashion with a conscience. Maybe this desire to get it ‘right’ has arisen from having two little girls to pass the world onto one day; or maybe it’s just age. The wish to go all morally correct on fashion has definitely been reinforced by my recent trip to Kamalaya. I remember coming back wanting to change the world. And as I am way too sleep deprived to change the world anytime soon, I am applauding my friend Emily for starting her own business of importing and selling beautiful, handmade and unique scarves. 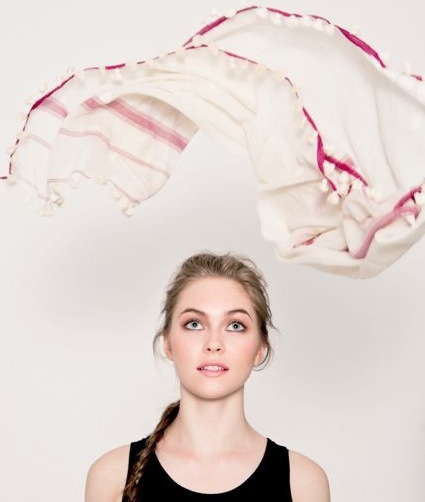 Candid Threads is an online shopping destination for scarf enthusiasts. Whether woven by up and coming designers in Ethiopia or produced by fair trade projects in India, each of them tells a story of colour, heritage, love and compassion. Every scarf is carefully chosen, helping their originating communities to generate sustainable business and make a positive impact on their local economy. Metropolitan Mum readers now have the chance to win a gorgeous scarf form the Eleni range. Have a look and tell me which one you lust after. Leave your comment by 10 December 2013, 2pm. The winner will be chosen at random. I love the Fushia one! They’re beautiful and I love the story behind them too. The fushia one is my favourite but they’re all lovely. I can relate to sleep deprivation getting in the way of changing the world. I always think perhaps it will happen after 7pm but then somehow changing the shape of the sofa is as far as I get. And I only have one! What a nice online shop (their cashmere scarfs are to die for – they look so soft). The blue and green one, please! They’re all so beautiful that it’s almost impossible to pick one that stands out! However I love the blue one. Good work Emily, a wonderful selection of scarves. i love that each scarf is unique and special. My scarves become an extension of myself. so to have a one-of-a-kind scarf with it’s own unique story seems just right…as it should be. I love them all, but I especially lust after the one in fuschia! The Eleni scarf in fuschia is beautiful! The blue is stunning, peacock-like. Can see me snuggling baby girl into this in her sling. Fuchsia wins hands down! Love the concept and the scarves are beautiful. In regards to the comment you left on my blog, I wish I was bringing all the children with us to China, but we can’t afford too. Oma and Opa are coming from Germany to watch 3 of the children. We will bring the 11 year old with us when we go over to pick up our daughter (we are adopting). The 11 year old loves history and loves traveling. No way would you pay me to travel 18 hours on a plane with a 2 year old if I didn’t have to. One 2 year old will be enough. They will have a blast with Oma and Opa! She cooks rouladen, strawberry kuchen, schnitzel, and guerken salat. Orange! Beautiful colous. Making me dream already of Spring time- warm afternoons in the park with my little one! I love theme all, but the blue cashmere is my favorite, I couldn’t resist and added it to my wish list. whoops, forgot to say which one. the purple and pink! They are all beautiful. What an incredible lady. They are all beautiful. I love the blue floral one.